Clay Mabbitt runs a blog and podcast called Sold Out Run where he helps theaters fill their seats with more than just friends and family. Basically, he’s a marketer and an actor. He’s using his skills and knowledge taken from his years working in a marketing firm in Indianapolis and applying them to find out ways to get butts in seats in theater productions. It seems to work because in 2010 he applied what he knew from his professional marketing background to his first theatre production, and he sold every seat for the entire run. Hence the name, Sold Out Run. Click Convert Profit — This episode is brought to you by Josh London’s Click Convert Profit and his book Flying Solo, the Smart Solopreneur’s Guide to Making Money Online. Overdrive – Borrow eBooks and audiobooks from your local public library. 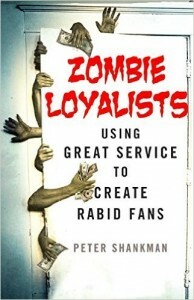 Zombie Loyalists by Peter Shankman: This is a book that talks about using great service to create raving fans, or in this case, Zombie Loyalists, that will not only buy your services, but also tell all their friends about you and get them to buy from you! It’s a good read for sure! • What he had to start with. • Focused on what could be done inexpensively. • Created a blog for the show and a content calendar. • Contests for free tickets. • Varying content for blog and social media outlets. • Staying Top of Mind. • Listing out what you’ll need and when you’ll do them. • Other resources at SoldOutRun.com. • Tells about the website he created for the show. • Doing mini profiles for the cast and crew and having them share it on their social profiles. • Having multiple points of contact with people before they actually buy from you. • For every show there’s a specific audience and a way to reach them. • Tells us about a marketing tactic that he thought would work well but ultimately fell flat. • Tells what he’s trying to accomplish with this venture. • It started out as him getting his thoughts out for himself in regards to marketing a theater show. • He wants to change the culture around the arts and make them more commercially viable. • He gets out his ideas and reports his findings. • Blog and podcast at SoldOutRun.com are all about helping to improve theater marketing. • His guest post: 5 Things Theatre Marketing Can Teach You About Promoting a Magic & Illusion Show by Clay Mabbitt. Talks about his Open Book Project where he tried to help a theater with a show that just didn’t work out. His very first production, Enter Love, and his successful marketing efforts with it . Clay was on stage with someone who forgot their place and he couldn’t help them. 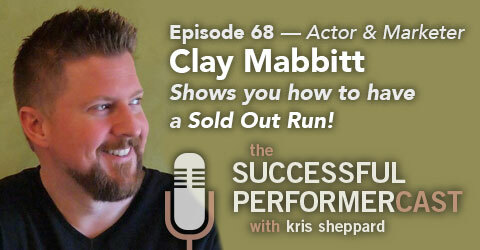 In his podcast, Sold Out Run, clay asks his guests a series of fun rapid-fire questions. I turned the tables on him and gave him a fun Rapid Fire experience of his own! • If you aways play it safe, you’ll never have any real big success. • Tells about his background in marketing and how he got into acting. Don’t get complacent with small houses. Where can we find Clay Mabbitt? ← S6E7: Brian Campbell — Show Business is Really People Business!